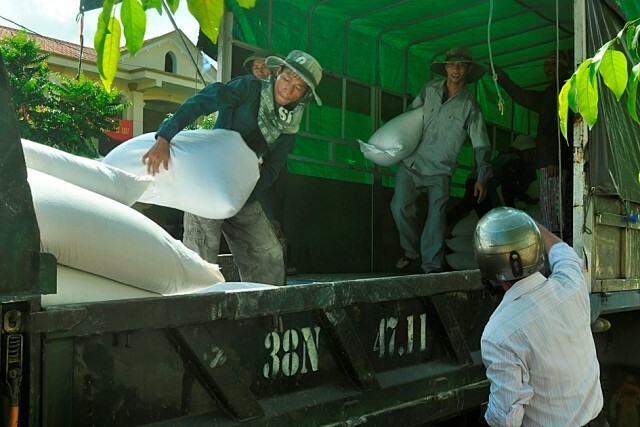 HA NOI (VNS) – The General Department of National Reserves (GDNR), under the Ministry of Finance, has so far this year allocated nearly 77,200 tonnes of rice to poor households and disaster victims nationwide. This move, following the government's instruction, aimed to ensure a quick response to help people deal with the unexpected, urgent requirements of emergencies such as natural disasters, fires and epidemics. In addition, another aid package of nearly 138,300 tonnes of rice is planned to be provided to students in provinces that are suffering from extremely difficult socio-economic conditions. The plan comes in response to the Prime Minister's Decision No. 36/2013/QD-TTg, dated June 18, 2013, which aims to provide aid to poor students over three academic years, from 2013 to 2016. In 2013-2014 and 2014-2015, some 124,100 tonnes of rice were distributed to students listed as policy beneficiaries. Of the remaining 14,200 tonnes of rice planned to be allocated in the 2015-2016 academic year, 7,000 tonnes have been distributed in advance. The remaining 7,200 tonnes will be received by September 30, 2015.